Erick is on his way to the event proper so we’ll be doing a tag-team liveblog of News Corps’ The Daily launch. It is happening at 11am Eastern – about two minutes from now. Refresh this page to see updates or you can watch the entire thing right here. 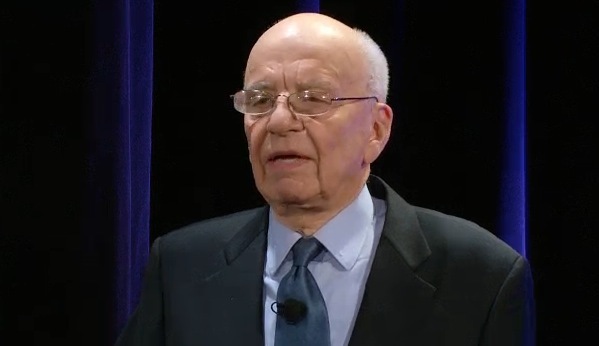 11:06am – Rupert Murdoch on stage. 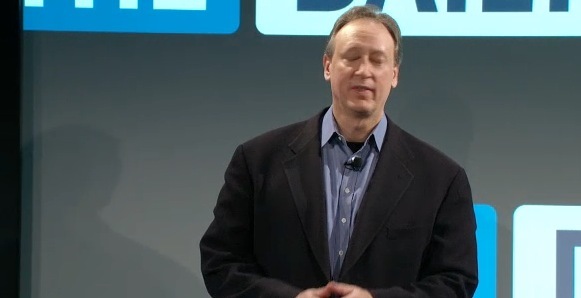 Welcomes us to the The Daily launch. He’d like to thank Steve Jobs. Calls iPad an incredible new platform. Steve has been a champion of the Daily from Day 1. 11:07am – New times demand new journalism. 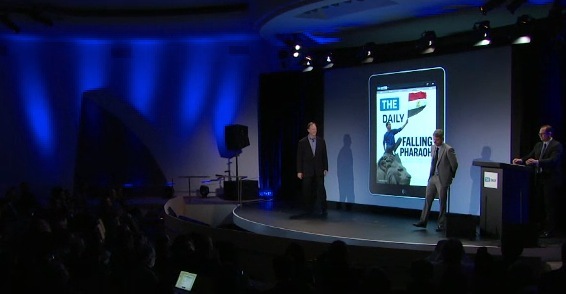 Best of traditional journalism combined with the best of contemporary technology. 360-degree photographs. Images that respond to the touch. The iPad demands that we completely re-imagine our craft. There is a group that is educated and sophisticated. 11:09am – This is the opportunity for true news discovery. We’re bringing the magic to the Daily. Make people think, make people smile, make them engage in the stories of the day. 11:10am – A remarkable age of information. Goal is for the Daily to be the indispensable source for news and information. No paper, no multi-million presses. The Daily is just 14 cents a day. Readers will enjoy the design of a professionally edited magazine. Stunning photography. Won’t lack for wit, opinions, or a sense of fun. More than 15 million expected to own tablets in the next year. Pricing is $4.25 a month or $1 a week. 11:13am – John Miller, Jessie Enzo, and Craig Daily talking about the project. Miller is the tech head, Enzo is the EIC, Craig is the publisher. 11:14am – Creating live content for six weeks. Working around the clock to get things done. 11:15am – Pictures and text, video, animations. 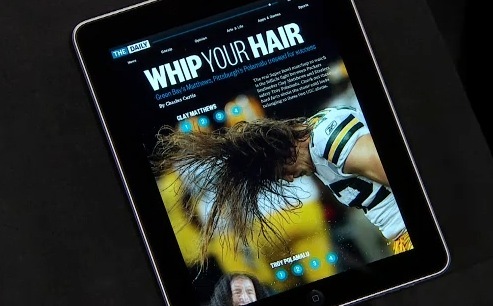 Audio, 360 degree images, HD video, video looks incredible on the iPad. Showing off a special series, Americana. Daily horoscopes, weather. 11:18am – There’s even a video anchor who introduces you to the issue. Share button lets you share to Twitter, email, Facebook, etc. Record text comments and audio comments. Pull HTML5 pages and link out in hyperlinks. Twitter feeds of famous people appear right on the story. Many App/Game reviews available in the Daily. Customizable team Tweets. Pick the teams you want to follow and it pops up. First two weeks are free courtesy of Verizon. The app is going live at noon Eastern, right after the event. 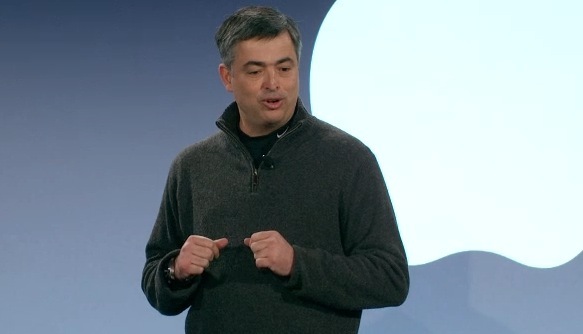 11:23am – Eddy Cue from Apple on stage. This brings News Corps powerful resources. Billed weekly at 99 cents or yearly at $39.99. 11:26 – Question time. Event is pretty much over. Back issues aren’t saved on your iPad. No real way to find older articles. When is Apple going to make that tech available to other publishers? Cue: Apple will announce the same deal for other publications soon. Subscriptions are only going to help them get more publishers. How will you determine this is successful or not? Murdoch: By selling millions. Miller: We’re competing with Angry Birds. What’s the political tone of The Daily? Murdoch: It’s in the hands of the editor. Enzo: We’re patriotic. We love America. Why did you focus on launching The Daily rather than an existing publication like the Wall Street Journal. 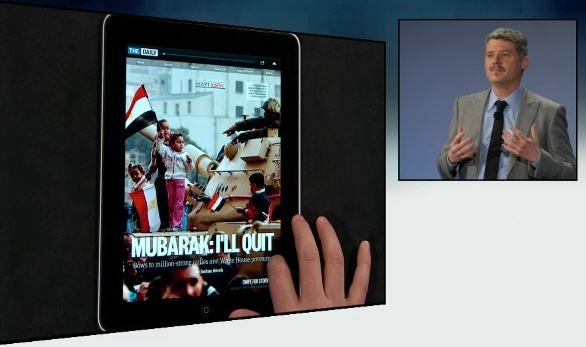 Murdoch: The WSJ looked so good it got me excited about tablets. 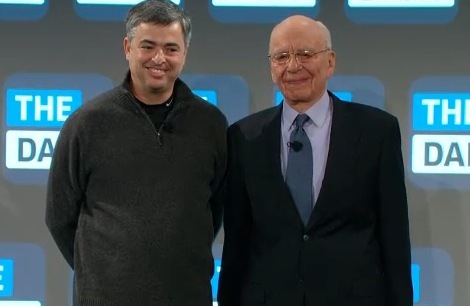 Murdoch: We’ve been very upfront with Apple. We expect to be on all major tablets. But this year and next belong to Apple. That’s just a market judgement. Will The Daily be free on the web? Enzo: Shared pages will be available, but you can’t go to TheDaily.com and get the content for free. Murdoch: It’s better for advertisers and we’ll draw better advertisers at a better rate. Who Is The Daily For? 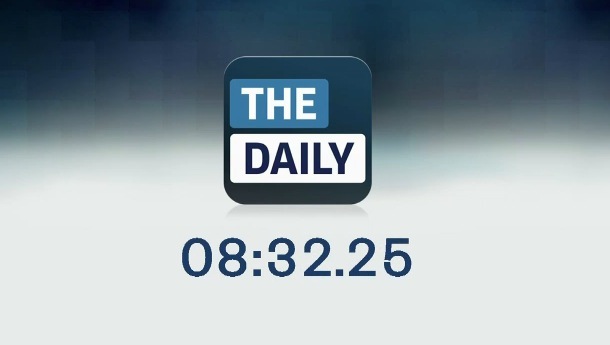 What Are The Odds We’ll See An Android Version Of The Daily?